Click to enlarge. From here. not much solace there, storm surge still nailed them, and the house will still likely have to be replaced. "not much solace there, storm surge still nailed them, and the house will still likely have to be replaced." True, but if there was anybody in the house, chances are they didn't die. But it's really beside the point, the point being that this house looks well build enough to better withstand more normal weather issues. Still, this was more likely a matter of luck, and a geotube that held just well enough. Starting where the beach meets the right edge of the photo, and going back, it looks like a few of them have held just enough to somewhat disrupt the inflow of the surge - if that's what those black bars are. Meanwhile, I get to continue subsidizing those stick houses via FEMA. I'm in Austin, but I listen to WOAI out of San Antonio. They took in lots of evacuees, and they have been doing a lot of reporting on what's going on down there. The caption shows this home was in Gilchrist. 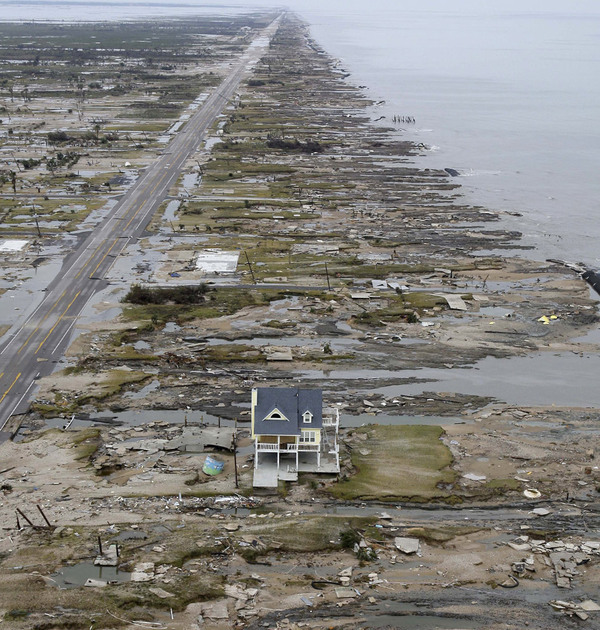 I heard a report on WOAI that the mayors of all the communities on Galveston Island had finally had a meeting together, and the mayor of Gilchrist said that before Ike, there were about 150 structures. Now, there are 8. Also, Texas law says beaches cannot be privately owned. So, even though this one house survived Ike, it may now in violation of state law, depending on where the new high/low tide lines fall. They don't replace the sand from eroded beaches there - it's a waste of money, because it will just get washed away again over time. But, I can't feel too sorry of the home owner. Apparently, this type of risk - losing your home to the natural process of beach erosion - is written into the contracts at the time a home like this is purchased. They could lost their home, and not be entitled to any compensation. Incredible - just as how all the comments on the original site mention God in one way or another - My guess on this basis is that the house left standing was favoured by god in some way rather than through better construction! Follow the link and look at image #25. Does OSHA approve that seating system? On a more serious note regarding construction designed to withstand natural disasters, using hurricane nails the next time you re-roof your home will only add about $15 to the cost of the roof, but this measure will provide incalculable protection against storm damage. As a family friend who's owned homes in Galveston for 30 years says, "Never put more money into a home in Galveston than you're willing to put a match to." Most of these homes do NOT have flood insurance of any kind. It's just too expensive. I recall reading that the yellow house was built to withstand a Category 5 hurricane.